I’m always about six months behind on understanding what most social media abbreviations mean. I think I just learned what SMH meant a few months ago (it means “shake my head” if you didn’t know either. Also, welcome to the clueless club.). I have an aversion to all acronyms and prefer to just USE THE WORDS. But whatever, I’m old and grouchy and an English teacher that thinks people should just say what they mean. Is that too much to ask? Wooh, calm down, Mary. This isn’t even what your topic is today. Geez. Fresh start: let’s talk about “non-scale victories,” shall we? A non-scale victory is something not related to the pounds you weigh (or have lost), but something directly related to that current number (or loss). And sometimes these little triumphs are better than the number on the scale. Real life moments when you realize all your hard work is changing your life, not just the scale. 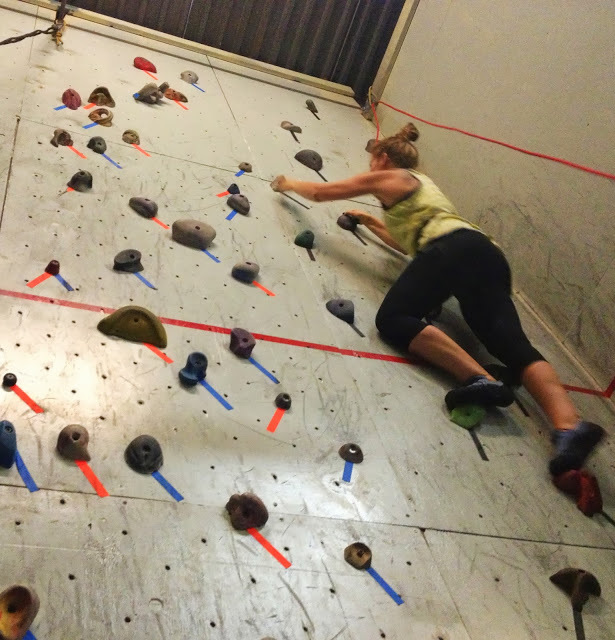 Moment #1: Rock climbing with my favorite local mom’s group. I signed up on a whim and then never looked back. Which does get me in to trouble some times, but this time paid off. I haven’t been strapped into a harness and had someone else be responsible for making sure me and all my weight doesn’t come crashing down to earth at a horrifying speed since high school. Almost fourteen years ago. But I did it; I climbed walls, scaled tall buildings, and wore an unflattering rope-thing around my privates like a champ. 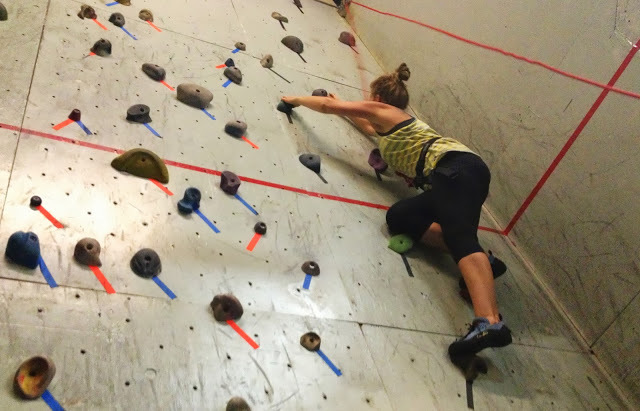 I had the upper body and lower body strength to support myself, to climb without falling, and to not look like a complete fool in the gym. 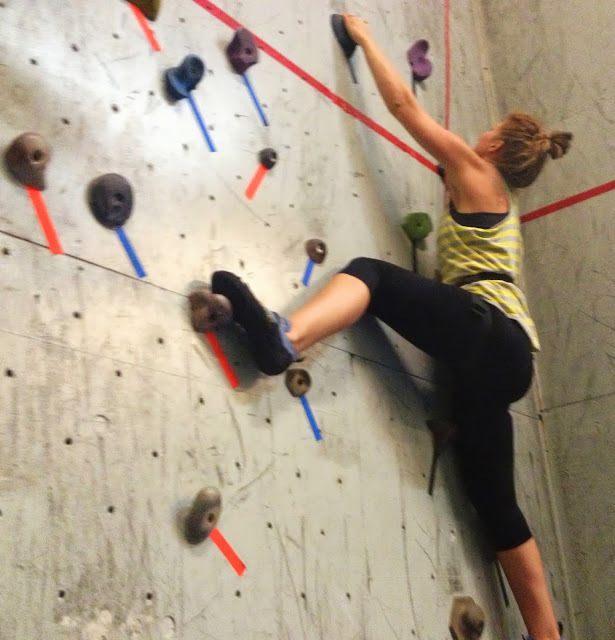 It was the first time I’d tested my body outside of the safety of my local Y and not failed. It was so encouraging (it was not encouraging to be unable to lift my arms over my head for the next three days, but I think that has more to do with age than weight…). I grabbed a pair of 12s and they were too big. At first, I didn’t even know what that meant. My first thought was dang it, I really like these pants. AND then I realized I could go down another size. And I bought them. Because they were a size ten. And I haven’t worn a ten since middle school. Moment #4: Easily running two miles. I hate running. Every single moment of it, I hate it. But I keep doing it because I see what it’s doing to my body and my health. The first time I did it, waayyyy back in March, I was glowing for a week straight. I ran two miles and lived to tell about it! Moment #5: You’re my goal weight. #NSV are the new black. Love this. Love YOU! Rock it, girl. You are such an inspiration! UGH! you are making me REALLY want to start running now, and i hate running. i am SO slow and i don’t want my clumsiness to be apparent. BUT…you’re @themarygrahameats instagram account is what motivated me to get going. my goal is 50 by 35. pounds by birthday. and all be DARN if i’m not going to get there with great motivation like this! 🙂 WELL DONE FRIEND. #WDF.